There may be times when you want to give test participants access to a certain tool or resource: a calculator or a periodic table, for instance. Or maybe you are giving an open book test about policies and procedures and wish to make a PDF available for participants to refer to. You can provide these types of resources within your assessments within Perception Authoring Manager. Use the question-by-question (QxQ) template and enable Perception’s Assessment Navigator, which allows participants to move easily from one question to another. Any tools that you use must be web based or accessible via a network from the computer the participant is using. If you are adding more than one tool, each tool will display in the same order as it appears in the template. 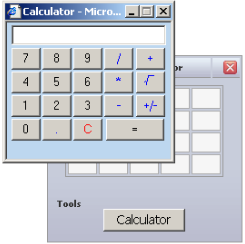 The Questionmark Perception version 5 repository comes with a calculator tool that can be enabled or disabled in the template. Other tools can be stored as a resource and added to the repository. You can add third-party tools to assessments, too. These tools are not stored directly in the repository but can be accessed via the Internet or network the participant’s computer is connected to.